Time waits for nobody and the Flat season is already back on our screens with the 2019 season on the turf beginning at Naas this afternoon. Horses will arrive with varying levels of fitness ahead of this meeting and it could prove tricky for punters. There are some who have been in action more recently than others either at Dundalk or over jumps and it could be a dual purpose horse that takes the major honours in the Lincoln. We haven’t seen Warnaq since Christmas when she was a faller over Christmas but Matthew Smith’s stable star could well bounce back with a career best on the level. The talented five-year-old was a fancied 7/2 favourite when falling at Leopardstown and although looking held at the time, she may not have reached the height of her powers on the Flat just yet. A warm day at Naas yesterday would have dried the ground out a bit but it could still prove quite testing for a lot of these Flat performers but Warnaq does have form on very testing and slightly quicker ground so the underfoot conditions certainly shouldn’t be an issue for her. A winner at the track over 10 furlongs, Warnaq also bolted up at Navan over a mile and while that Navan win last year came off 76 and the Naas win was 79, she is up to 88 now but there is a chance that she could catch a few of these more seasoned flat runners a bit rusty. The draw in stall 5 shouldn’t be much of an inconvenience and at 11/1 she is a decent bet. Dermot Weld has a few strong chances of opening his account for the season on the opening day and Yulong Gold Fairy is probably the pick of them in the Group 3 Lodge Park Stud Park Express Stakes. Another who is proven on the ground, she comes into this race well treated on the ratings and the ground does look to be key for the four-year-old. It is hard to know at this stage of the season how these fillies have trained on but anything near her run in the Irish 1,000 Guineas when fifth behind Alpha Centauri is surely more than good enough here. Yulong Gold Fairy is the pick. 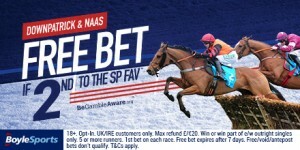 Out Sam has entries in the Topham and Grand National at Aintree but is more likely for the BoyleSports Irish Grand National at Fairyhouse on Easter Monday and he can land the Ulster National on his way to Ireland’s richest race. The 10-year-old has to haul 12st1lb around Downpatrick today but he ran a very good race in the Thyestes Chase and that is a strong line of form coming in here. Third in this race last year behind his stable companion Poormans Hill, it could be fair to say that Out Sam has been improving since then and he won the Cork National back in November on good to yielding ground. this could be a good opportunity for Out Sam to bag anoher nice race. Niall Cronin is The Herald’s racing correspondent for nine years covering all the major meetings including Punchestown, Cheltenham, Aintree and he has followed the Irish-trained runners to the last three Melbourne Cups. 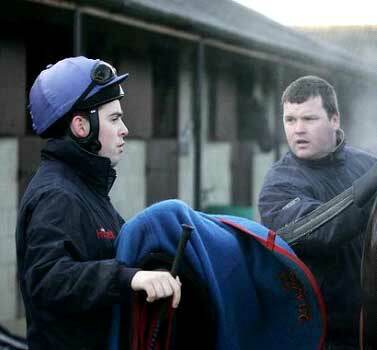 Niall also rides out on a daily basis for trainer Philip Dempsey in County Kildare.